Hardly a day that passes that someone somewhere on this gasping planet does not come up with a bright idea for a project for constructing high cost new infrastructure the main achievement of which ultimately will be to increase the number of vehicles in whatever the given space is. This is so well known at the leading edge of transportation thinking and practice that it would be hardly worthy of discussion, other than the fact that these bright ideas appear all too often and in all too many places. They need to be dealt with in a positive sense and with as much diplomacy as we can muster. Here is a perfect example from Penang which is refreshing given the way in which the author takes on the challenge of making a positive proposal instead of just lambasting the tunnel option. One might prefer not to specify the technology that will be used to improve throughput on the existing road/bridge system in this increasingly congested part of the world (in this case LRT or monorail). However the main fundamentals are in place in this excellent newspaper article and worthy of the attention of all of those of us who care about sustainable transport, and above all the people and voters of Penang who are in a position to make this choice themselves — and not have the final decision foisted on them by people with approaches and agendas that do not necessarily match up with sustainable transport policy and practice in the 21st-century. After all, it is their city. island may not necessarily solve the problem. of traffic flooding the island. effectiveness in opening up new areas for development is questionable. right up to Sungai Petani in Kedah. 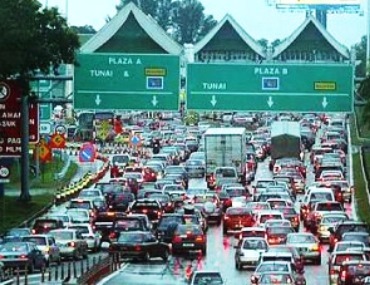 since the early 1980s when the Penang Bridge was being mooted. infrastructure job to little-known Consortium Zenith BUCG Sdn Bhd. implementation of the mega project. not need to wait for federal government funds. is a rapid transit system for George Town, with a link to the mainland. factories and schools and even to go to hospitals. the cost for a rapid transit system can be reduced. infrastructure does not require approval from the federal government. little reason for the federal government to oppose such a move. far from enough to swing the votes. that the project takes off. * M Shanmugam is managing editor at The Edge. This article wasfirst published in The Edge Malaysia Sept 16-22. This entry was posted in 2013, Civil Society, Infrastructure, Media coverage, roads & bridges. Bookmark the permalink.